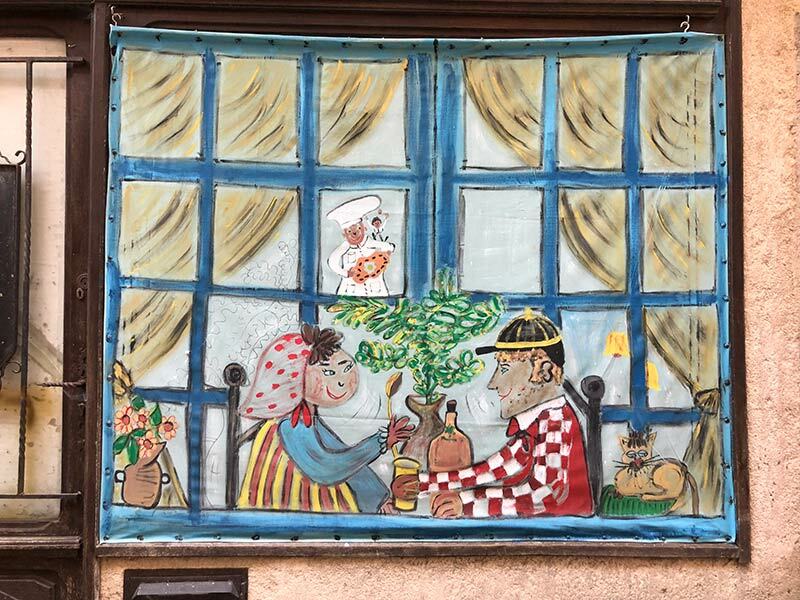 We had never heard of this village of Mirepoix. 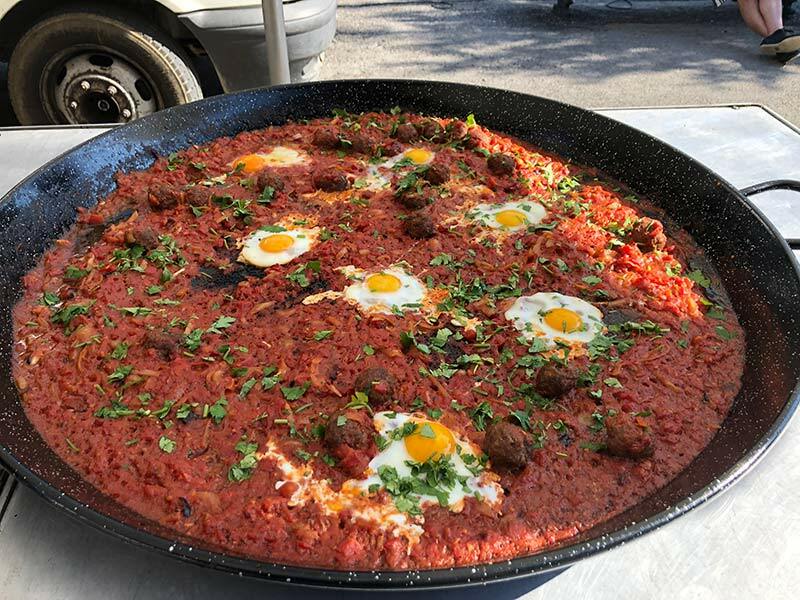 Gordon just did a random selection on our road trip through Spain and France. 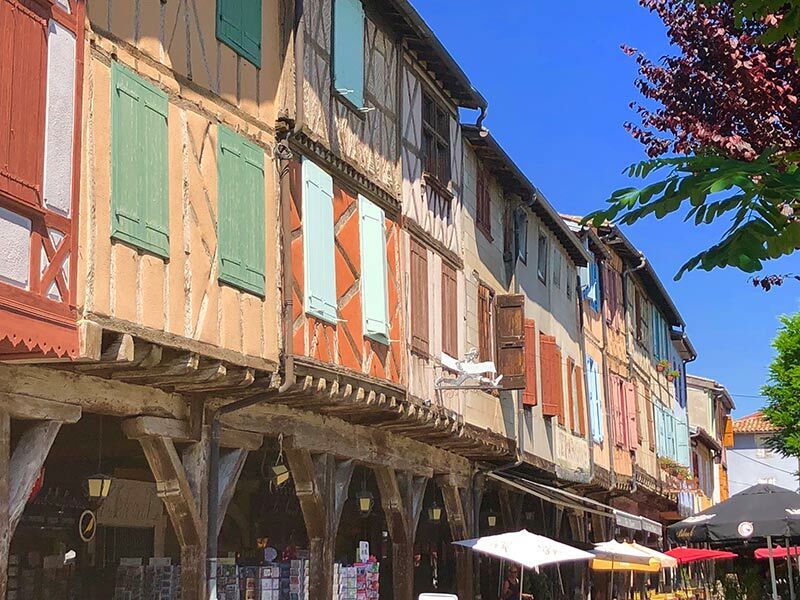 Bastide de Mirepoix is a fortified village built in medieval times, and this Guide to Visiting Mirepoix in France, will help you get the most out of your adventures. 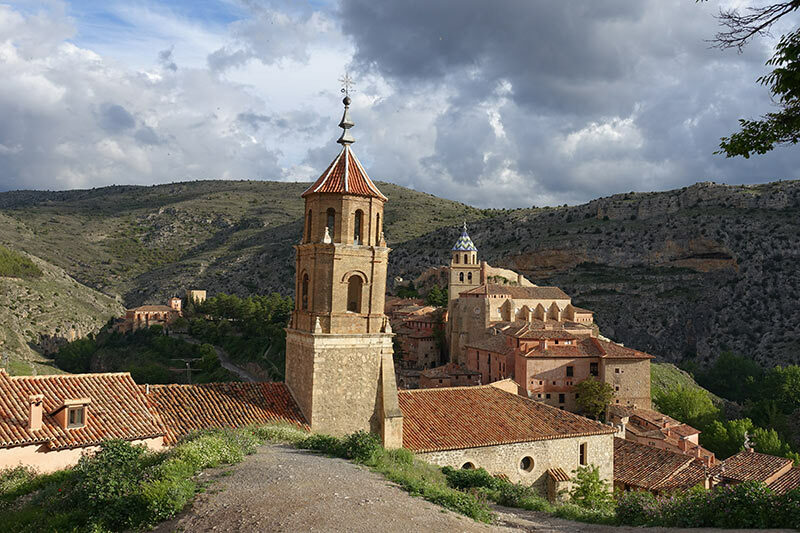 On our road trip through Spain and France we visited some of the officially recognised most beautiful villages in Spain and we recommend that you also visit Morella, and visit Albarracin. We were headed to France for a luxury barge cruise. However, as Australia is so damn far away we thought we would make a journey of it. 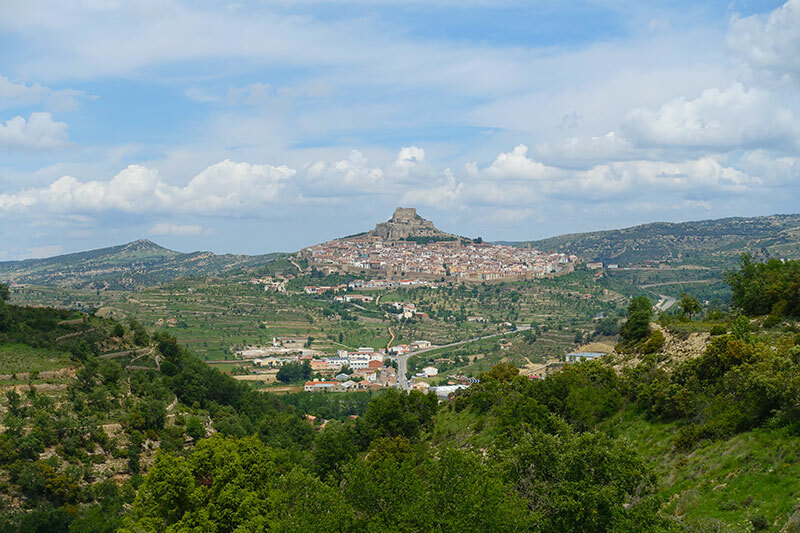 After visiting these beautiful villages, and they were, we headed to Haro in the La Rioja area of Spain because this is wine country, and well why wouldn’t you. From there to Zaragoza, which I didn’t like, but I was in a bad mood. 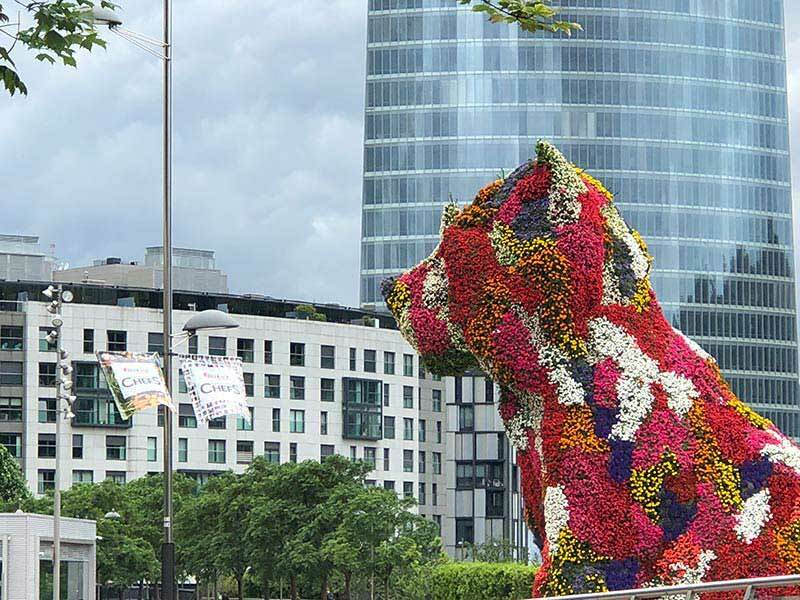 From there to Basque country at its best, visiting Bilbao for the Guggenheim but also for the pintxos. Then it was to Hondarribia purely because a lady from our gym hails from there and told us to visit. That is what it is all about, serendipity. What we discovered was an amazing town, and one we recommend to you. 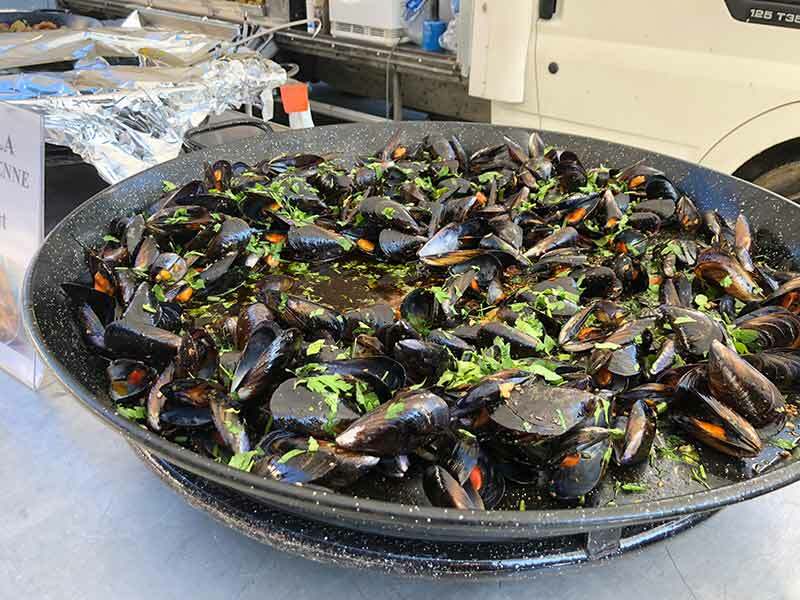 We travelled to Bayonne – not a fan, and then to Pau which we needed more time to experience, and then to Toulouse …. a bit ho hum. We then went to Foix, and I can tell you I am a massive fan and will return one day. It was then time to visit and stay at Mirepoix, which I will now get around to telling you about. 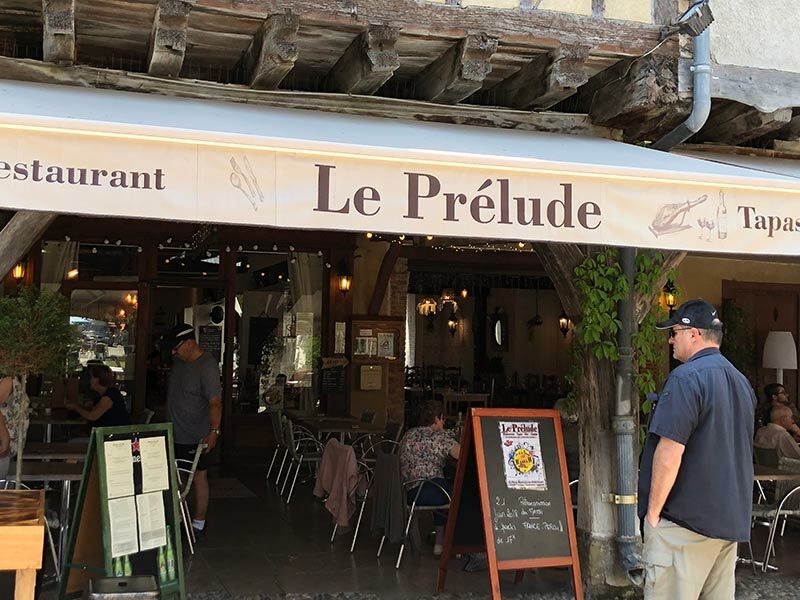 Mirepoix, pronounced Meer Pwa, or something close to that, is a place we recommend you visit when you are in southern France in the midi-Pyrenees area. 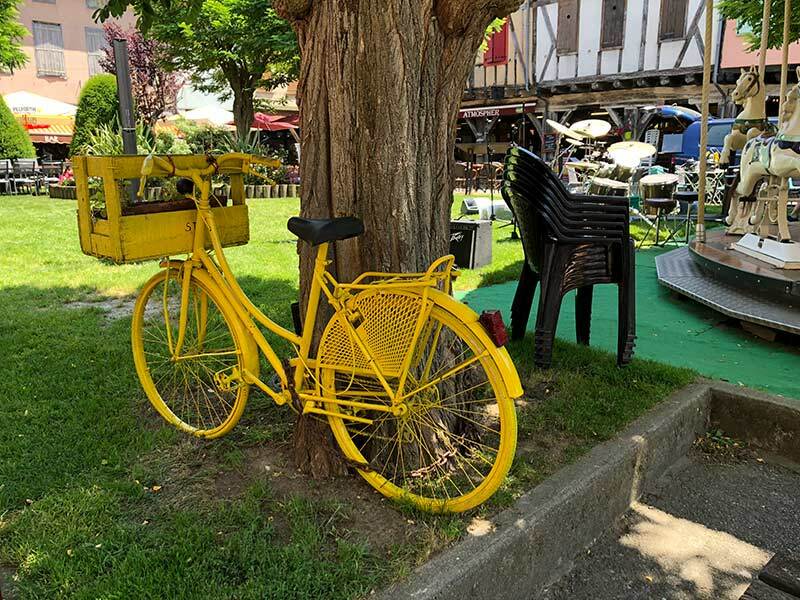 Let’s face it – the Tour de France goes through Mirepoix, so watch for this delightful little town when watching this event. 4,000 people (max.) it depends on who you ask. Some say less. 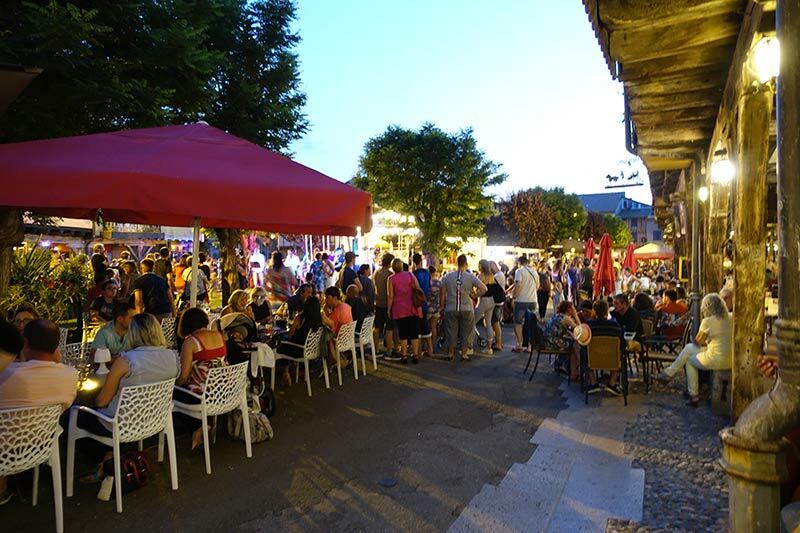 Apparently, because the town has quite a few festivals it has kept the younger people in the town, rather than moving to the cities, which we saw was problematic on many of the islands of Greece, like when we visited Corfu. 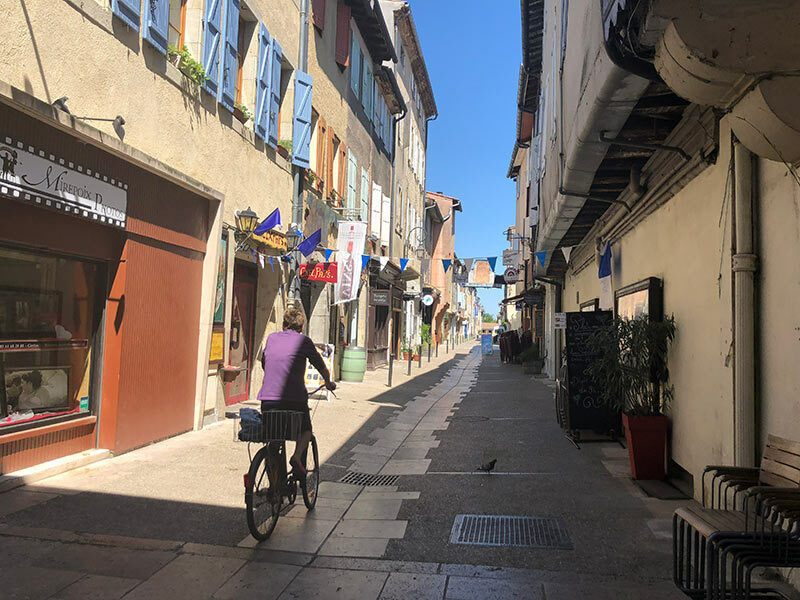 Mirepoix is halfway between Carcassonne and Foix (the town we totally loved). 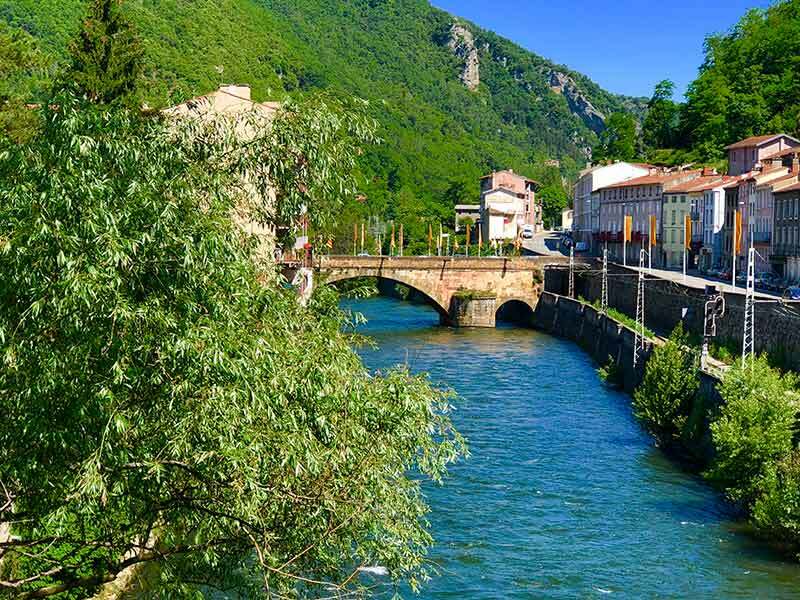 It is located in the Ariege department of the Occitanie region of France. It is 90kms from Toulouse, and in the midi-Pyrenees area of France. You can see the snow on the peaks of the Pyrenees, after you look over the verdant countryside. In the 11th century, Mirepoix existed on the right bank of the Hers River. Before the crusades it was an important village with an impressive castle. 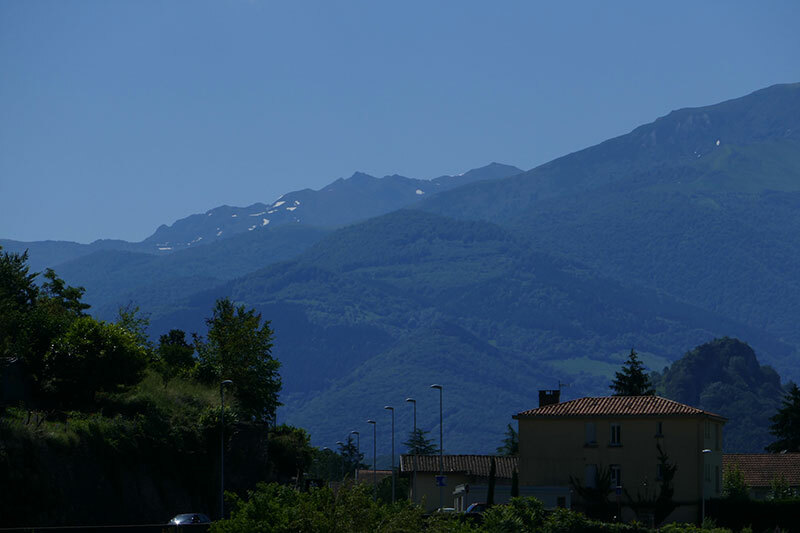 It was strategically located between Carcossone and Foix, and an excellent trading centre. Simon de Montfort and his army besieged the castle and he granted the town to one of his first lieutenants, by the name of Gui de Levis. However, in 1289, the dam at Puivert (in the neighbouring area a commune in the Aude department in the Occitanie region in southern France), broke its walls, flooding Mirapoix and destroying it. Gui de Levis relocated the town to the left bank, creating a town plan that was to be emulated by many. The new plan involved a large central square to make economic and social life of the village of Mirepoix easier. 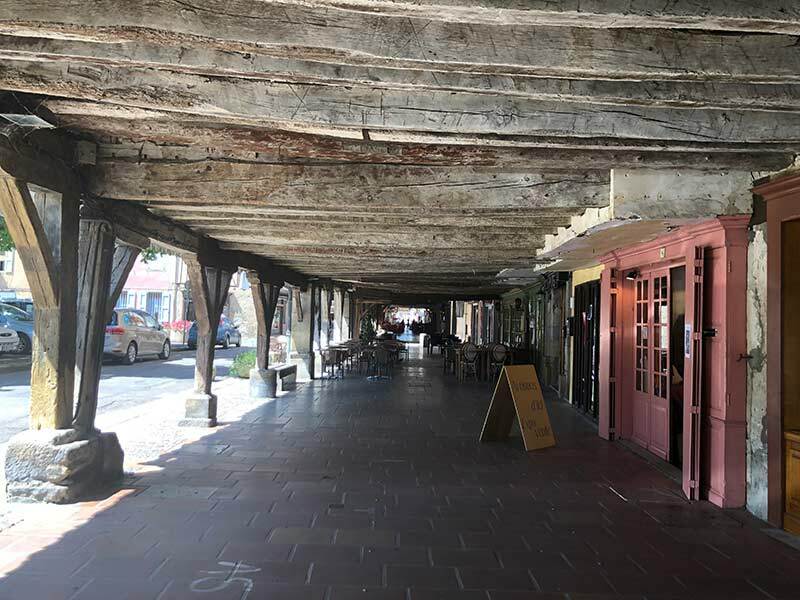 The shops would be under a covered gallery of oak pillars, and this can still be seen today. The streets were and are laid out in a grid formation. 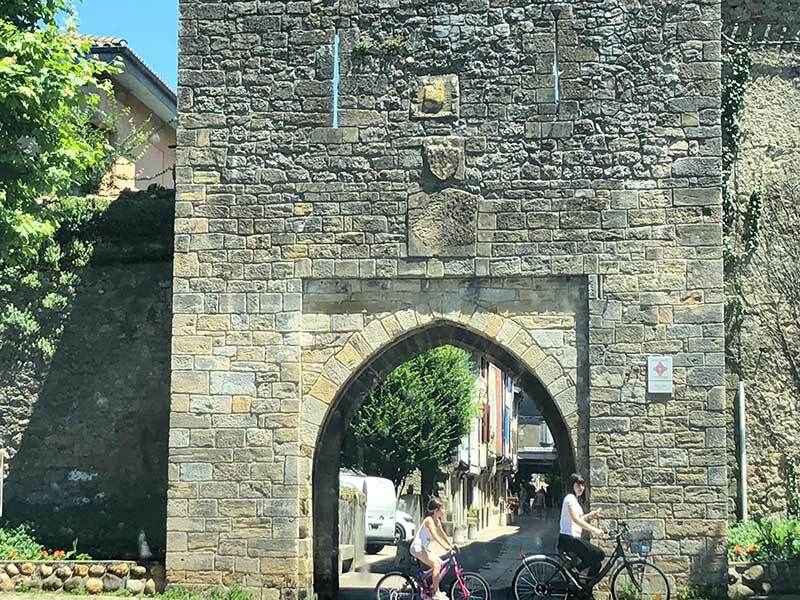 During the Hundred Years war, Mirepoix suffered, and was fortified to protect it from attack. You can see the remains of part of the walls at Porte d’Aval, a 14th century fortified gate. The Levis family held control of the town until the French Revolution. 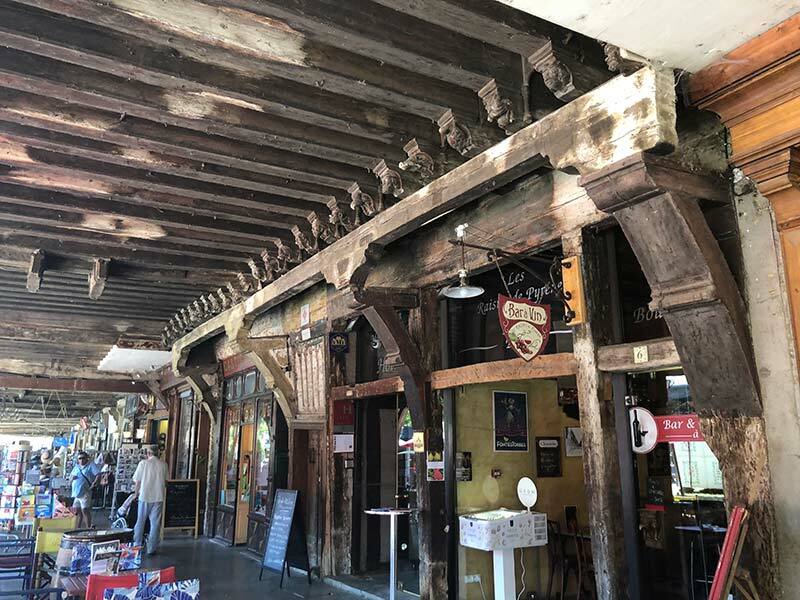 Also known as The Place des Couverts, the Central Square of Mirepoix is, as was intended by Gui de Levis, the main focal point of this delightful town with its many timber houses and daubed walls supported by enormous wooden pillars. The houses above the shops and cafes and restaurants all reflecting the medieval history. 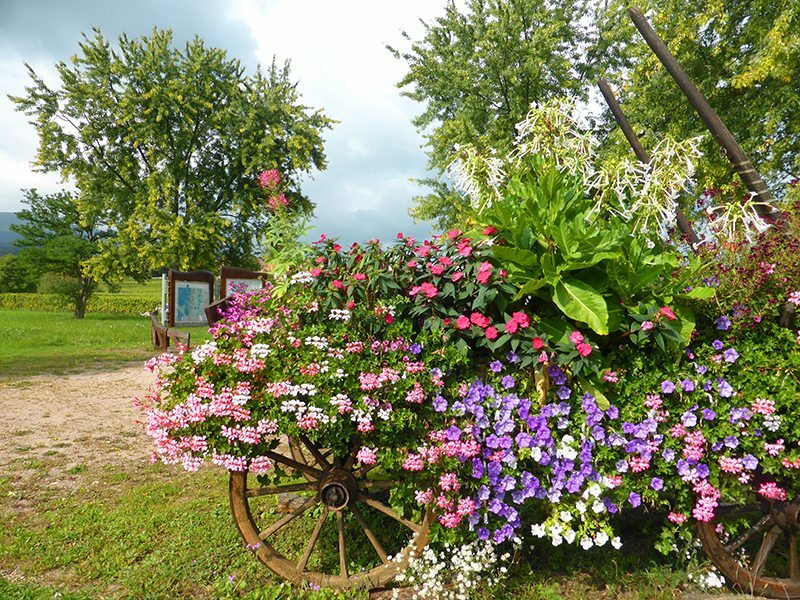 Flowers are everywhere, and this is where many of the festivals that Mirepoix has become well noted for are held. Outside the Mirepoix Tourism Office, which you should visit are, there are two grain measures dating from the 17th -18th century which hold 20 litres of grain each. Unfortunately, now they seem to be used as ashtrays. And there is a lot if fresh produce, as the surrounding area is very rich agricultural land. The most famous market is held every Monday morning, and people travel from as far as 100km to attend these now famous markets of Mirepoix. There is also a smaller market on Thursday morning, which is well worth visiting. The present site of the Central Square was reduced in the 15th century when the southern galleries were erected. 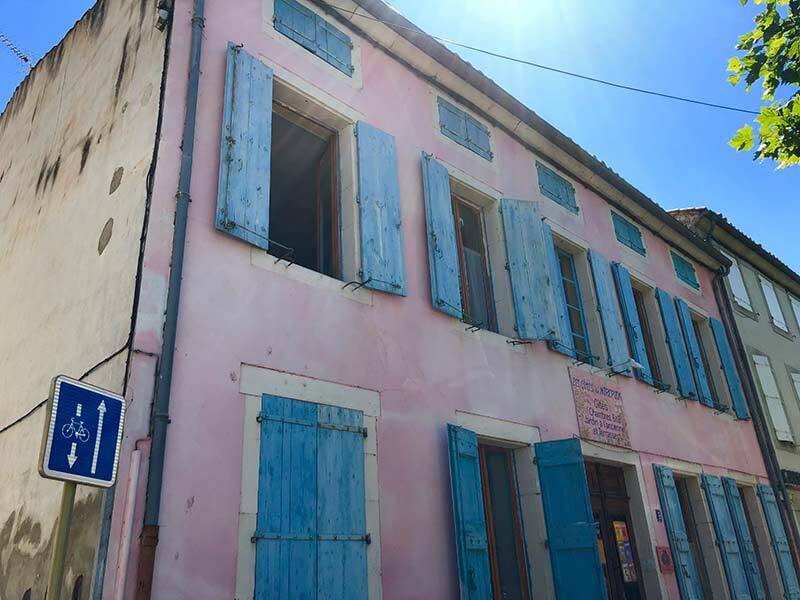 Also, to be found on The Central Square of Mirepoix, this was the house of the magistrates of Mirepoix. Here you see carved decorations typical of medieval industry. From bearded men, to alligators and tortoises, to tragic faces and more, it is now a bar and café, and very much worth stopping for a beer to look at these medieval sculptures. Saint-Maurice’s Cathedral in Mirepoix took forever to build, but has French Gothic influences, and is different and you should visit. b) it has a 22-metre-wide nave, (the central part of the church) making it the second largest in Europe. Girona in Spain has the largest. Book to visit at the Tourism Office or go early in the morning when the church doors are open. 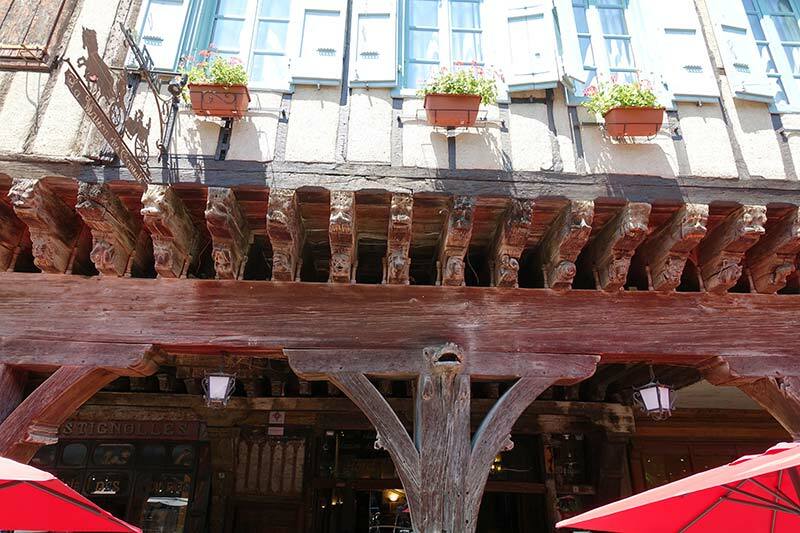 We first saw these open-air market halls in the delightful Foix, just 35 minutes away. Expect relief from the sun, and I think the cold, but these are characterised by the open sides, overhead roofing, and rich ironwork. 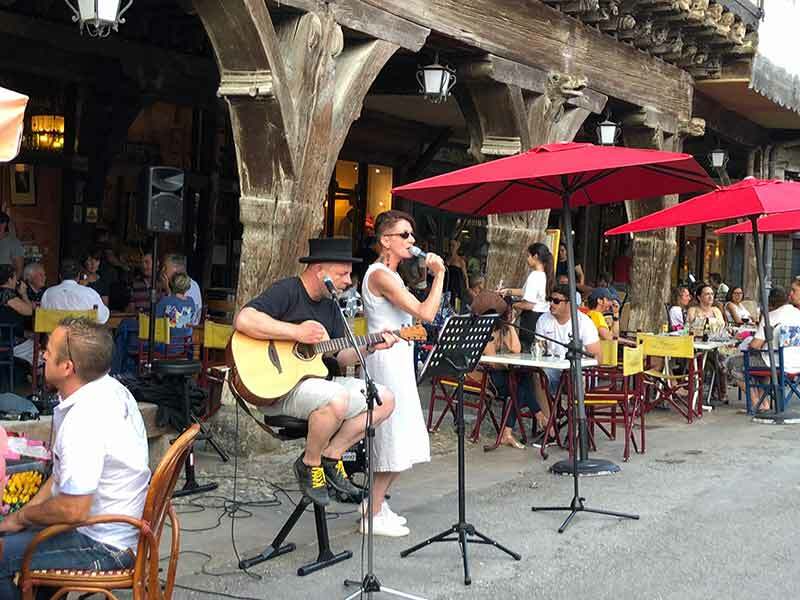 This is where the Monday and Thursday markets take place in Mirepoix, and where many restaurants and cafes use them as extra seating, and where local and visitors people gather and mingle. 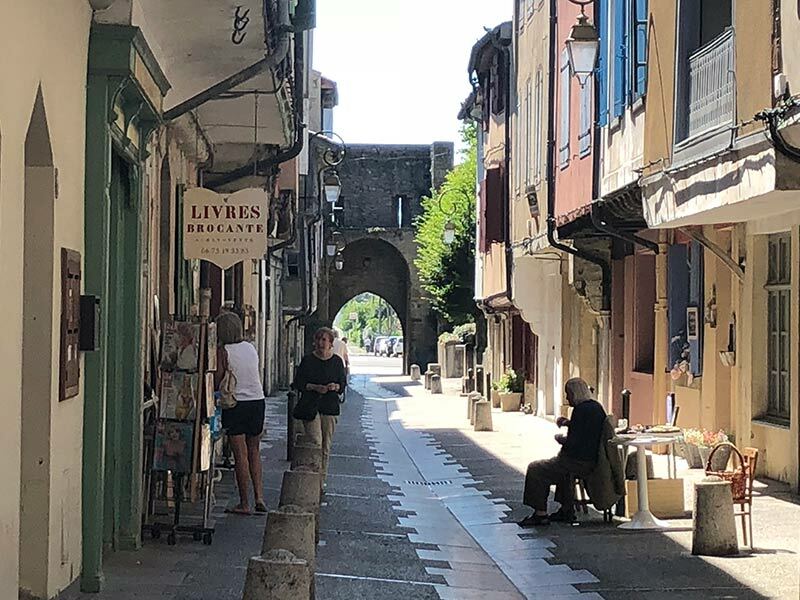 As an aside, we noticed that a lot of British people visit, or have relocated as ex-pats to Mirepoix and/or the surrounding French villages. 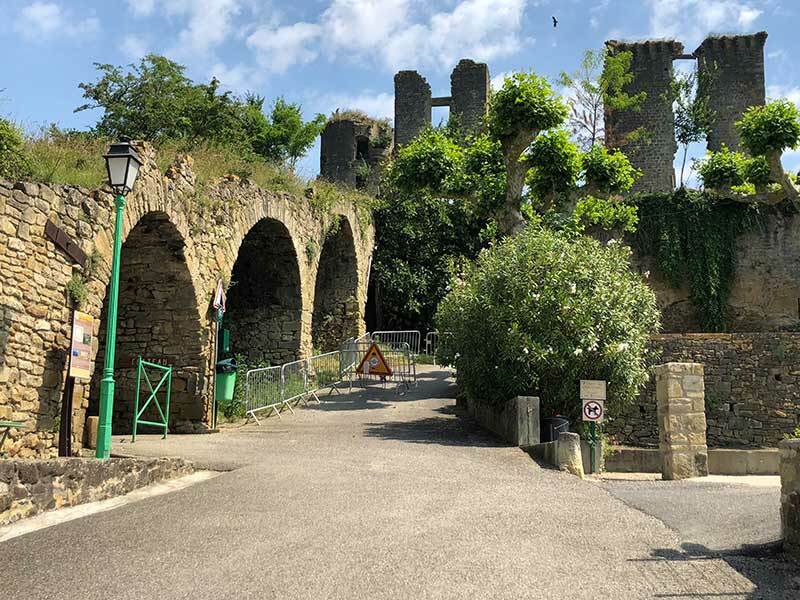 35 minutes from Mirepoix because it is beautiful, and has a magnificent castle, Chateau de Foix lots of cobblestoned streets, lots of bars and restaurants, and a beautiful river running along the town. Top this off that it is surrounded by lush green hills, and it is certainly a town we would return to and stay. Time your visit correctly and you will see the Tour de France go through. 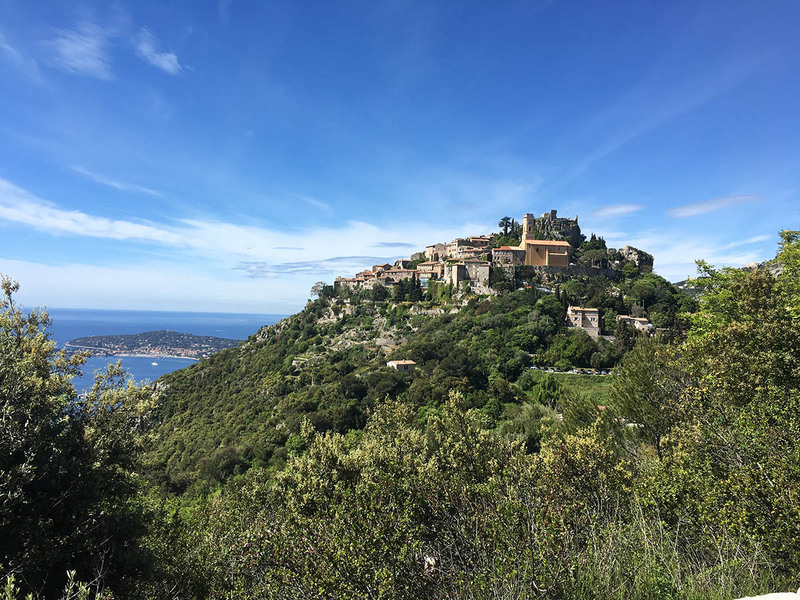 Take the back roads from Mirepoix through some of the most amazing landscapes, and through some archetypal French villages. A local lady we met in a café, gave us these directions, and we suggest you also follow these to get to Lac Montbel. Leave Mirepoix by the Lavelanet road. Just before the next village of Bastida de Bouzignac, turn left onto Chalabre road. Keep going until you see the turn off the Belloc on your right. 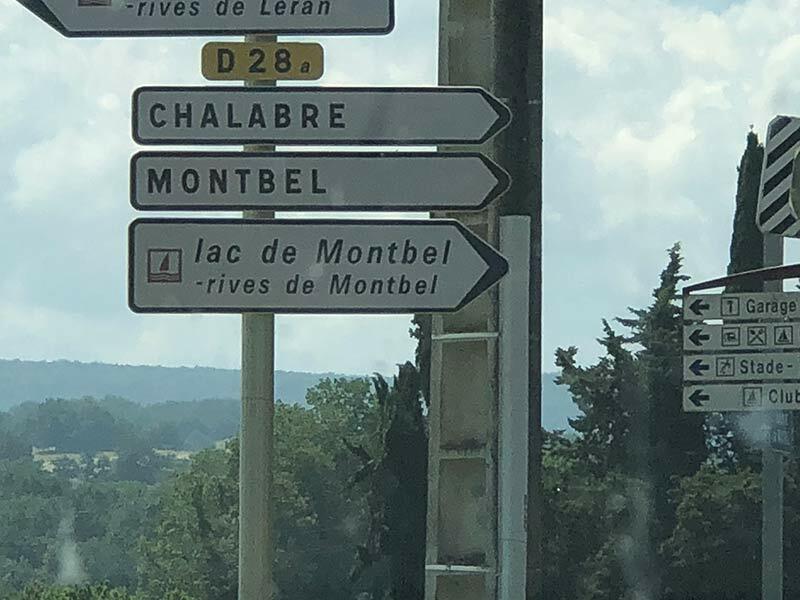 You will see Chateau de Lagarde on your way to Lake Montbel. It is a ruined chateau but has been listed as a ‘monument historique’ by the French Ministry of Culture, since 2014. There are tours at 3 euro of the castle. Caves. France has some of the oldest caves in the world, with Paleolithic and Neolithic wall paintings. 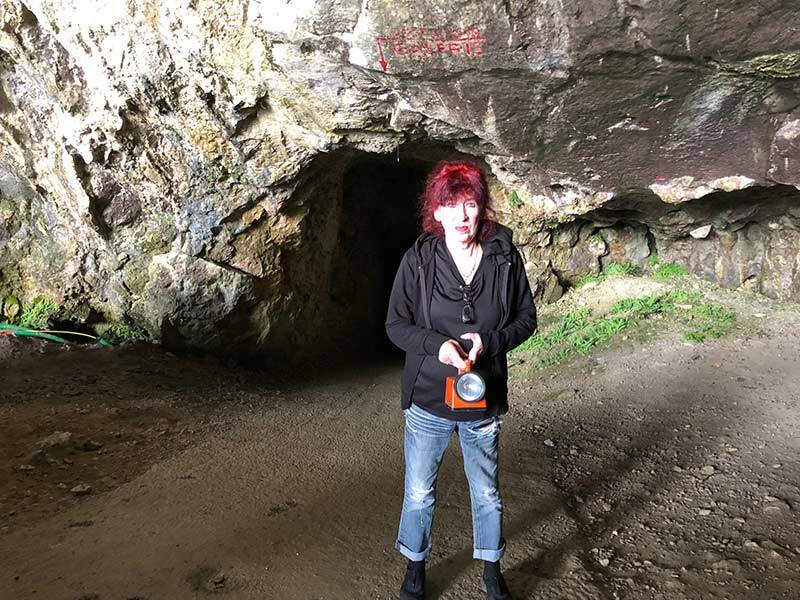 Read about our experience exploring Niaux Caves, France. 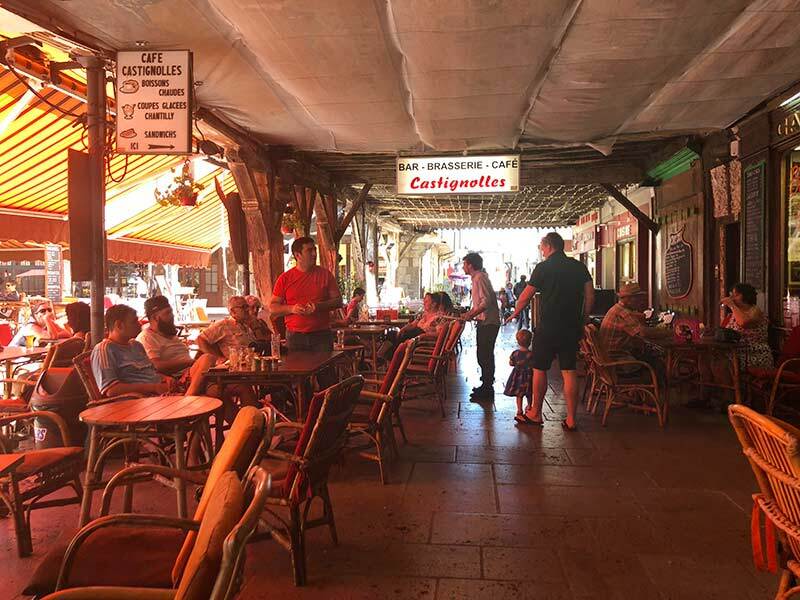 There are many many cafes and restaurants, which is quite surprising considering the small population. According to our gite owner, these are the best and we did try them. Great ambience in a trendy garden setting, with some very local dishes and some excellent presentation as well as service. 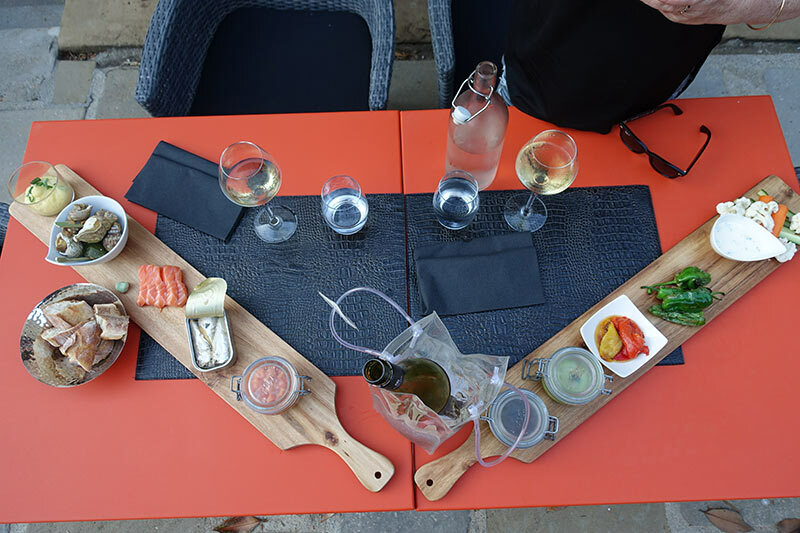 This is a tapas and a French restaurant, and we liked it a lot. The food was generous and very good, and the service outstanding. It had a great atmosphere. We stayed at a gite Les Gites de Mirepoix, just off the Central Square of Mirepoix, so the location was perfect. It was quirky, spacious and worked. While it says it is a B&B, it isn’t but that didn’t matter as the Central Square was across the road, and they actually open early. Latest prices here.